Members of the University of Pennsylvania's Annenberg (Lunchtime) Running Club helped catch an alleged thief last month. They want you to know there's a lot more to their mission than protecting and serving. 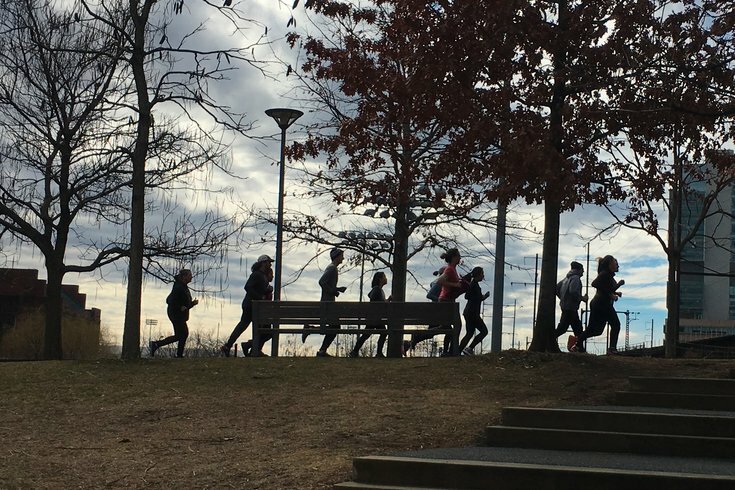 You’ve likely heard about the University of Pennsylvania running club that – in early January – chased down an alleged burglar. The suspect had “barreled out of Steinberg-Dietrich Hall” as someone yelled that he’d taken a laptop and cellphone. They gave pursuit. What you haven’t likely heard is what the members of Penn’s Annenberg (Lunchtime) Running Club think is the actual moral of their story. • Prior to setting out on their 30-to-60-minute run, circumstances arose that left running club members chasing suspect Talib Adams after finding themselves smack in the middle of an apparent crime scene. • The runners chased him into a construction site, but were told they couldn't enter. • They asked a construction worker to call 911 and thus helped Penn police apprehend him. • Kyle Cassidy, a digital design specialist at the Annenberg School for Communication who co-founded the running club in 2016, suffered what his doctors termed "tennis leg" from sprinting and turning quickly during the chase. (Crutches and a cane would follow temporarily). • The headlines soon wrote themselves. Speaking about the incident on Friday afternoon, he conceded that the “catching a thief story” was obviously cool. Cassidy got involved because of a need to break away from his desk during the day in the pursuit of fitness. Soon, the group would decide to run outdoors three times a week, which many found less boring than going to he gym alone. The study that Cassidy referenced was done by club member Natalie Herbert who, in 2014, started working on a graduate school project at Annenberg School for Communication centered on encouraging peers to exercise. "At the time, grad students had no access to the gyms at Penn," she said. "We started offering access to free workout classes involved in our study." From there, they delved into investigating how online social networks can encourage others to exercise if they knew other peers were doing so. In all, 790 students were involved in an 11-week study that sought to answer whether "support or competition" had more of an impact on prompting peers to exercise. The results, published in Preventive Medicine Reports in December 2016, found that competition far outweighed friendly encouragement. The running club, which started around the same time, has embraced that mission in the form of a listserv where members unable to be at that day's run can update everybody on what they've done by way of physical fitness instead, Herbert said. One of the more curious activities is the roving lecture; Cassidy said 12 or fewer runners is the ideal size, to allow runners to "perfect their elevator pitches" about cool projects they're working on. Topics have included cryptocurrency mining in Iceland, a mobile app developer talking about solving social problems through crowdsourcing, whether functional magnetic resonance imaging could help foment understanding of human decision making, and a political-campaign statistician discussing how voters are polled. "We run slow enough so the person giving the lecture can talk and others won't drop off the pace," Cassidy said. "It's four minutes of a lecture with a 15-minute question-and-answer session." Adams, for whom there are nine aliases listed on court records, faces formal arraignment this week on charges including accessing a device issued to another who did not authorize use, criminal trespass (breaking into a structure), theft by unlawful taking and receiving stolen property. Court records state that Adams has pleaded guilty in the past to charges in the past including theft by unlawful taking, defiant trespass, disorderly conduct and providing false information to law enforcement (2012), unauthorized use of a motor vehicle (2013), driving under the influence of a controlled substance and theft by unlawful taking (2015).